The town of Roslindale, Massachusetts sits just six miles southwest of the city of Boston. Roslindale is considered to be a garden suburb of Boston which attracts many families to the area not only for the convenience of living close to Boston but also for the beauty of the large green spaces including the Arnold Arboretum and many local small parks. Historically Roslindale is known for its large colonial homes but recently many of these homes have been transformed into condos and duplexes to accommodate the increase in a younger crowd of individuals moving to the area. As a result, Roslindale offers a large variety of homes including condos, townhomes, single family homes and small apartment buildings. Roslindale also provides easy public transportation into Boston and the downtown area through the MBTA orange line and commuter rail. Due to Roslindale’s location within the Boston metropolitan area, there is no shortage of professional opportunities within a short commute. Wondering what there is to do in Roslindale? The downtown area provides a wide variety of amusements such as shopping, a showcase of annual events organized by small local businesses, and several bistros to indulge at! Just a few examples of these attractions include Sophia’s Grotto, a mediterranean-style restaurant known for its lovely outdoor seating and mouth-watering cuisine, or Delfino Restaurant, an italian eatery known for its cozy atmosphere and satisfying meals. If you’re in the mood for a classic American style restaurant with live music and delicious comfort food, check out the nearby Birch Street Bistro, one of many other local restaurants. Local events include farmer’s markets, winter farmer’s markets, an annual egg hunt, live music and a community organized event called the Holiday Wander. Thinking about buying a home in Roslindale? There are many affordable options for buyers with a wide variety of incomes. The average home for sale has about three bedrooms, three bathrooms, 2,500 square feet and an average price of $599,000. Some smaller options include condos and apartments that range from $320,000 to $450,000, depending on location and size. 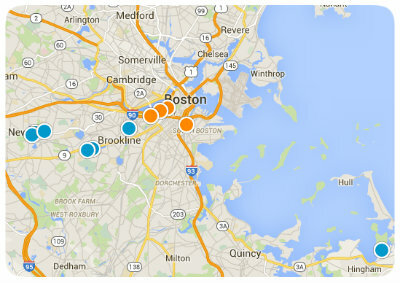 The closer you are to Boston, the more expensive your search will become. For example, a typical four bedroom house could cost anywhere from $500,000 to $850,000 depending on size and location. The community of Roslindale encompasses a wide number of families and individuals of different backgrounds and professions. The alluring town of Roslindale is an extremely welcoming and vibrant place to live with an extensive historical background, a safe neighborhood and a thriving economic base for young and experienced professionals. If you would like more information about Roslindale, Massachusetts real estate please contact us today! 144 Cummins Highway Condominium Bldg. Taft Hill Terrace Condominium Bldg.